The Simeone Foundation Museum and Sports Car Service have combined their efforts again to present their second show highlighting SAAB. This time it is all about road racing SAABs. The title is "The SAAB Racing Spirit Lives On" and runs from May 9th through the 24th. Twenty cars were accepted into the show in all. A full list and descriptions are included below. Like last time, my Quantum Two has been invited to take part and I am honored to assist. For this show, two of my Dad's cars were invited, the Quantum One and his Sonett V4 "Spyder". Race enthusiast and SAAB engine developer Rolf Mellde was the main visionary behind creating the 2-seater roadster that would become the Sonett I. The name Sonett was derived from the Swedish phrase, “Så nätt den är” meaning literally "so neat they are". This example is #6, the last of a total of 6 prototypes constructed. It has raced with the VSCCA at such tracks as Pocono, Lime Rock, Schenley Park (Pittsburgh Vintage Grand Prix), and Fairmount Park (Philadelphia Vintage Grand Prix). This car can be seen on permanent display along with a grand collection of vintage SAABs at Sports Car Service in Wilmington, DE. Originally designed and built by Walter Kern of MA in 1959, this car is based on Saab 93 components (drive train & suspension) and competed in the Sports Car Club of America’s H-Modified class for several years starting in 1960, primarily in New England but also in the 6-hour race in Marlboro, MD. It has been raced in vintage events with the Vintage Sports Car Club of America since 1989. For more information, visit www.quantumsaab.com. The second of the Quantums designed and built by Walter Kern is currently vintage raced in its “barn find” condition. The installed engine is a replica of the SAAB Competition Department supplied 750cc two-stroke it raced with in the early 60's. That original engine was returned to SAAB after the car's competitive career concluded. While the body, such as it is, left something to be desired, the engineering in the chassis is rather impressive. Note the torsion spring suspension and twin outboard radiators with air fed from behind the front wheels and exiting through the doors. For more information, visit www.quantumsaab.com. Sporting an 850cc engine, this car was originally raced by Rex Harison of Salt Lake City, UT. It was brought east in 1999, restored to competition specs, painted, and numbered to replicate Joseph Christ's (Chuck's father) 1964 season car. The car has raced at Watkins Glen , Elkhart Lake , Sebring , Virginia International Raceway, Summit Point , and numerous other tracks. It is one of the most visible vintage SAABs in North America, due in no small part to the bright orange color common on competition SAABs of the era. Mary Anne Fieux and Chuck Christ co-drive the car in the Pennsylvania Hillclimb Association series. Over nine different people have owned this Saab (so far). It began as a Pennsylvania hillclimb racer in 1965. Driven by Dennis Snyder it had many 1st place finishes at Jefferson, Duryea, Giants Despair, and Hershey hillclimbs. It’s hillclimb days ended in 1974. It changed ownership a few times with no additional records of races. In 1989, Wendell Francis rebuilt the car into a vintage racer, taking it to Road Atlanta several times with various drivers. It was rolled in 1989 at the Summit Point “Blue Gray Challenge”. In 2003, its present owner re-purchased it to continue its vintage racing career. You can see hot-shoe driver Randy Cook taking the turns with the Vintage Racing Group (VRG) at the Hershey, Watkins Glen, Lime Rock, and Thompson Speedway events. Introduced in 1963, the Quantum IV was sold as a kit through SAAB dealers in the United States. For $1,097, the kit consisted of a chassis and body. The purchaser then would add the suspension and drive train from a Saab 96 to create their racecar. This particular example was restored by Kevin Pampuch in the late 1990’s. He raced it with the Vintage Sports Car Club of America at Lime Rock, Roebling Road, Summit Point, and the Pittsburgh Vintage Grand Prix. For more information, visit www.formulasaab.com. This SAAB was owned by the late Bertil Sollenskog. It holds world records earned at the Bonneville Salt Flats and the Ohio Mile in Wilmington, Ohio. Bertil broke the existing world record at the Bonneville Salt Flats in August 2011 with a two-way average of 110.187 mph. Then in September of 2014 his crew from Chicago set another record of 112.642 mph. Bertil also set a new record with the East Coast Timing Association in September 2013 with a standing mile speed of 97.3815 mph at the Ohio Mile. On the way to the Simeone Museum, Tom made a stop at the Ohio Mile on May 2nd and 3rd to set new records in 3 classes; J/Pro - 107.6040 mph, I/Pro - 105.3124 mph, and H/Pro - 104.9196 mph. The car's two-stroke engine is currently equipped with fuel injection and reed valves. This car is chassis #1 of two built and is a copy of an Elva Mk6. It is the ONLY copy recognized by the official Elva registry! It is powered by a SAAB 750 GT engine. The body is from a Begra MK3. It uses all SAAB suspension and brakes with an Austin Healey Sprite steering rack. Joseph Christ built and campaigned the car until it was sold in 1969. It ran first as an H-Modified class car then later as a D-Sports Racer at venues in the northeast. Chuck Christ purchased the remains of the car and restored it to the original 1967 H-Mod livery, including numbers cut from the original 1960's stencils. It has recently competed at Pocono, Summit Point, Virginia International Raceway, and with the PHA (Pennsylvania Hillclimb Association). Weighing only 800lbs, it is quite nimble. 1967 was the first year the 96 received the V4 engine. This early example still has the small windscreen used on the two-stroke models. It started racing in the SCCA in 1976. In 1980 Willie Lewis purchased the car and raced it in the GT-3 class at tracks in the northeast as well as in support races at Circuit Gilles Villeneuve and Trois-Rivières. Willie retired the car around 1983 but he went on to win the Barber SAAB Pro Series in 1986 and became an accomplished pro racer. Len Schrader arranged to return the car to competition some 20 years later. Having been well preserved in a barn, it required little to go racing again. Len currently races the 96 with the VRG, SVRA, HRG, and at the Lime Rock Vintage Festival. A total body-off 2-1/2 year restoration was completed in 1986, including the owner-designed custom bodywork. The car's competition history began with autocross events in 1996, then transitioned to vintage racing in 2005. With outright wins at the Pittsburgh Vintage Grand Prix and the Mount Equinox Hillclimb, it continues to be highly successful in regional events sanctioned by the Vintage Sports Car Club of America and the Vintage Racer Group throughout New England and the mid-Atlantic States. This Sonett was originally a V4, rallied with the SCCA. It was later backdated to 2-stroke power within SCCA rules and has become one of the most raced Sonett 2-strokes in the United States. It raced in both SCCA and HSR vintages races all along the east coast at such tracks as Sebring, Moroso, Road Atlanta, Roebling Road, and Mid Ohio, to name a few. Randy Cook and Ken Payne built the car into a vintage racer and then co-drove at the HSR Rolex Endurance Series in 1991, where it won the under one liter class. 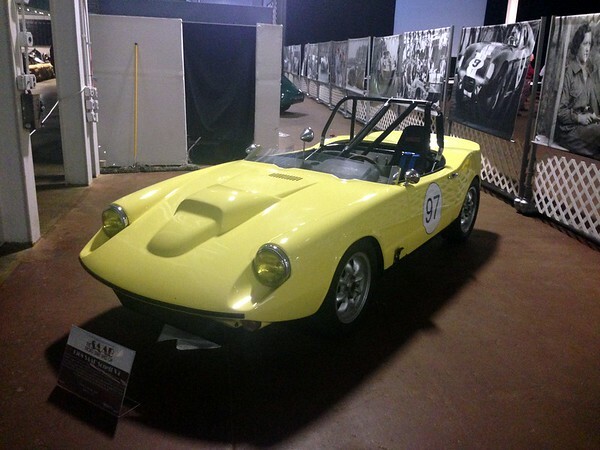 After its final race in 2005, where it took 1st in class at Sebring in the 4-hour Enduro, it was retired to the Lane Motor Museum in Nashville, TN. This is one of the Jack Lawrence built “wide body” Sonetts. It was originally delivered to Alistair Oag. Alistair raced the car from 1978 to 1980 at several tracks in the northeast including Watkins Glen, Mid Ohio, Nelson Ledges, Summit Point, and Lime Rock. It then changed owners 4 times and had various drivers that extended its competition history in the area. In 1997 Tom Cox purchased the car and refreshed it to get it race-ready again. When Randy Cook is not driving Tom's 1960 Saab 93F he will climb behind the wheel of this car. 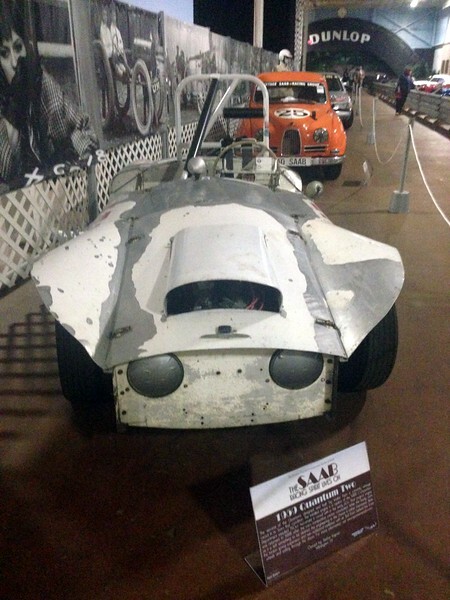 This SAAB Sonett was made into a race car in 1978 for the SCCA’s F Production class. In 1983 it won the SCCA Runoffs at Road Atlanta. In 1987 the SCCA reclassified the Sonett to GT4, where it won numerous SCCA NASPORT championships. Presently Number 97 is being prepared for the SCCA’s GTLite class. Grand” series it went on to compete in the BF Goodrich Radial Challenge Series. It raced at such tracks as Bridgehampton, Pocono, Virginia International Raceway, and Daytona, where it was clocked on the back straight at 152 mph while pushing 8500 rpm. Fitted with a SAAB “B” motor with minor modifications, this car won the Twin Sixes race at Sebring, FL in 1992 and was also the 1992 series Endurance racing champion in the Improved Touring B class. The only modifications allowed in the class were race safety equipment, suspension, and exhaust. It raced from 1988 to 1995 at southeast tracks such as Road Atlanta, Daytona, Rockingham, Savannah, Sebring, and Atlanta Motor Speedway. It was raced by its owner, Jack Baxter, for its entire 7 year career. In that time it completed every 24 hour endurance race at the famous Nelson Ledges road course in Ohio, which amounted to over 112,000 racing miles. This 900 was prepared to race oval dirt tracks and with the owner and driver Claude Hutchings at the wheel, it was the car to beat during its racing career that began in 2005. Over a 4-year period it took home 48 feature wins at various northeast tracks, including three track championships at Brewerton Speedway, NY. With a normally aspirated 8 valve engine that was balanced and blueprinted by Brad Shaffer of Kansas City, MO it has pulled 244 crank horsepower on the dyno. In 1986, Saab Scania and Skip Barber came together to create the “Barber SAAB Pro Series”. Fitted with a virtually stock 225 HP, 2.0 liter, 4-cylinder SAAB Turbo engine the series ran from 1986 to 1994. 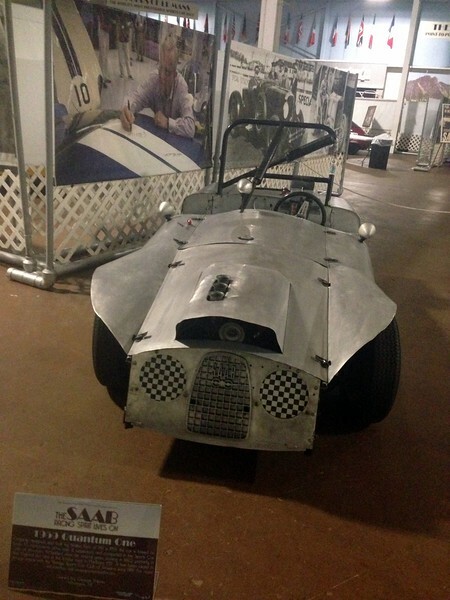 Many successful racecar drivers such as Robbie Buhl, Bryan Herta, and Juan Pablo Montoya, began their professional racing career in a Barber SAAB. This car is one of 6 “new generation” 900s that Saab famously ran at the Talladega Speedway in October of 1996. Saab was out to break many of their own national and world speed records set at the same track just a decade before. With over 25,000 miles completed at average speeds of over 140 MPH (including time for refueling, tires, oil changes, and driver changes), Saab topped many of their own records and set 22 new ones. The Tired Iron Repair/RBankRacing.com #184 Saab 9-3 Turbo made its endurance racing debut at Road Atlanta in February of 2014. It won the prestigious 14 Hours of Daytona that year and also racked up race wins at Watkins Glen and Road Atlanta. Fitted with a stock 2.0 liter engine, the car has been lightened and safety equipment has been added. When it leaves the Simeone Foundation Automotive Museum it will head straight to Daytona to attempt to defend its title. This car was created, along with a twin in black, by JL Racing in Canada to run in the Castrol Canadian Touring Car Championship. It won its first race and went on to win many more races and podiums over a four year career. With extensive modifications such as the addition of an limited slip differential, larger turbocharger, a stripped and acid dipped body, and slick race tires, the car was rated at between 350-450 crank hp using 94 octane fuel and recorded a 1:35 lap at the very demanding Mosport race course.